Before we started the trail, we thought we had a plan, a formula if you will, for success. We told everyone we planned to complete the hike in about six months, maybe more, and we didn’t expect to be capable of consistently doing much more than ten miles a day. Our formula was to take it slow and focus on avoiding injury. We pretty much abandoned the original plan within the first two weeks. We started pushing bigger days because we felt good, we wanted to pass through the “crowds” (which we know are nothing compared to the big bubble), and because it was cold and we didn’t want to be done hiking at 4pm. So, now that you have the backstory and know that we’re in Massachusetts (wow! ), here’s our new and improved formula: slow down and focus on enjoying the walk. This means not feeling guilty about a short day here and there, or an unexpected diversion. Our new goal is to finish the trail within 5 months, which means before August 8. To make that goal, we need to average about 12 miles per day, which gives us plenty of wiggle room. I have to say, since implementing this plan, we are both feeling happier. But, I don’t think our old formula is all bad. 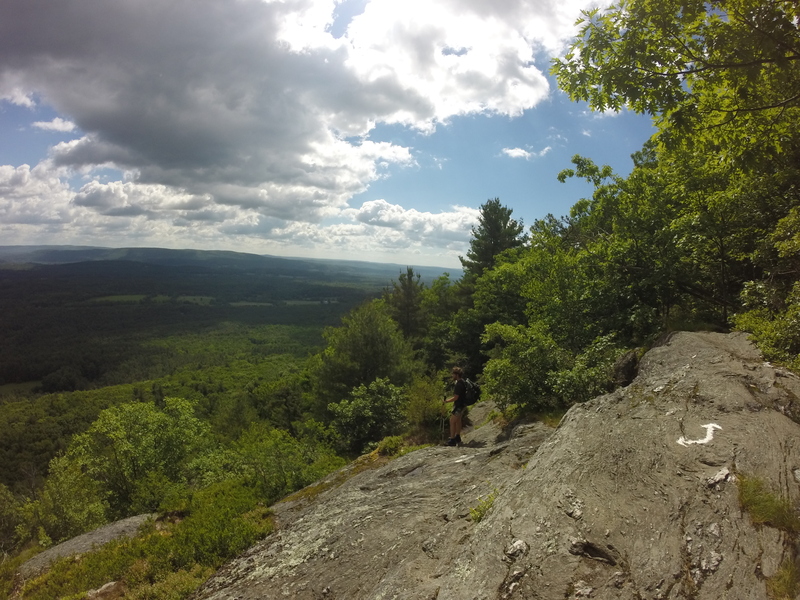 The hard work we put in for the first few months is now allowing us the flexibility to really enjoy the famed New England terrain. Taken advantage of the many delis in New York, including camping at one! If you put in less than a mile of walking off the trail in several places in New York, you’ll find yourself at an authentic deli with amazing sandwiches and usually a small grocery selection. Many are hiker friendly and offer a place to hang out or fill up water bottles. Tony’s deli, near Pawling, even allows hikers to camp on their lawn. We took advantage of their generosity and enjoyed delicious hot sandwiches for breakfast. The only downside was that the Amtrak train was about 100 feet from the tenting area and ran all night long, blaring the horn every time. But hey, I think that’s a small price to pay for a pretty unique experience. Enjoyed a night at Upper Goose Pond Cabin. Normally, if it didn’t fit into our mileage plan, we would skip a specific shelter or hostel. But now, we made our schedule fit around stopping at this spot. This cabin, named for its location on Upper Goose Pond, features a volunteer caretaker, canoes, a bunk room with actual mattresses, and most importantly – a pancake breakfast in the morning! It’s a beautiful location and feels like vacation, just without running water or electricity. Who needs that stuff anyway? Made resupply days much more relaxing. Previously, we would get into town and do our shopping, laundry, and any other stops as quickly as possible to get back to the trail and stay on schedule. Now, we’ve decided that there’s no point in stressing out over a few miles, so we just get everything done as efficiently as we are able to without watching the clock too much. This makes it much more pleasant to talk with various people we meet in town and make sure we don’t forget anything! The reality that we might actually do this thing is really starting to set in. We have a little over 600 miles left, which simultaneously feels like a lot and not nearly enough. I’m not prepared to re-enter the real world yet, so slowing things down a little feels like we’re buying ourselves a little time. Then again, doing those big days can be satisfying, so maybe we’ll continue to throw a few in. No matter what, I think I’ve learned that there is no secret formula when it comes to hiking this trail. What worked two months ago might not work any more, and it might change again. The key is just remembering to enjoy the walk. Hi! My name is Mischa (pronounced like fish-a with a M), but my trail name is Tripwire. 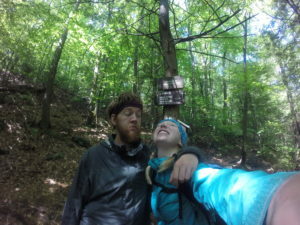 I completed a NOBO through-hike in 2016 with my adventuring partner Caleb (aka Limbo). Even though I've conquered the AT, I plan to continue adventuring and sharing my thoughts on the wonderful world of hiking. Thanks for reading! I like the OG plan of 10 miles a day. That’s 210 days or 7 months. Assuming you can afford to be away from “real life” that long, go for it. I don’t like crowds much either so I’m not sure how I’ll react to the herd. My daydream plan is to start early enough to start ahead of the herd; late Feb/early Mar. Even if we stick to only 10 miles a day, that would give 300 mile head start. By time the herd catches up, it will have stretched (and thinned) itself out. That’s the theory anyway. Finishing “too soon” is a concern. Actually returning to “real life” is my single biggest concern. The big 5-0 is only 2 1/2 yrs away; I’ve about had my fill of the “wonders” of the corp world. I have no real retirement plans nor hundreds of thousands of dollars saved up. But I am fairly certain that I won’t be able to put up with the current career after a thru hike. I want a job working at REI/Ganger Mtn/hostel etc. making just enough money to do a thru hike of something each year until my legs fall off. Great plan Bob! Also, a good thing to remember is plans change. My husband and I are thru-hiking and I swear sometimes our plans change hourly! It was hard to accept that at first. Flexibility is key! The plan you’ve mentioned is great because you get your miles done and you still have time to visit hostels/towns. I have really enjoyed talking to hostel owners or going to eat at local restaurants. I feel I’m learning a lot about our country and also learning that people can be good!! Also, I love your plans for after. I’m 25 and have student loans to continue paying, so I will probably return to the corporate world for a few more years. But I’m not sure I can do it for too long, as I really want to be debt free and work at a hostel/restaurant/REI/etc. Oh I know plans have to be flexible, all the more reason I want more time. I’m ok with flexible and rarely make detailed plans even in real life. Adapting and changing is easy for me. I’ve got that covered already. I don’t want to feel rushed. I hear all too often that ____ is 1 or 1 1/2 sideways miles and everyone passes it up. If I’m dead on my feet (which I don’t want to be either) and I just can’t walk another mile fine. But I don’t want to pass it by because I’ve got to do X miles today. I want to walk by a blue blaze, wonder where that goes, only one way to find out!! You’re walking 2200 miles what’s another 5? The other reason I want as much time as possible is because the only way I want off the trail is in a body bag. I’m going to trip. Something is going to get sprained. Hopefully nothing gets broken. I want a week off the trail to heal the sprained ___. Then I want to get back on the trail. The only hard date is the closing of Baxter Park. And short machine gun towers and electric fences, I’m still going to the top on Oct 16th. No way in hell I’m walking 2200 miles and you’re telling me the park is closed. You picked the right time to slow down (although 12 miles a day is kinda big stuff in New England stretch of the AT). Beautiful up there. (2) you won’t be able to properly savor the best that that AT has to offer.